When it comes to staying in a bed and breakfast, sleeping is only half the equation. A morning meal can make the difference between an OK stay and a life-changing one. Needless to say, choosing the right inn is essential. 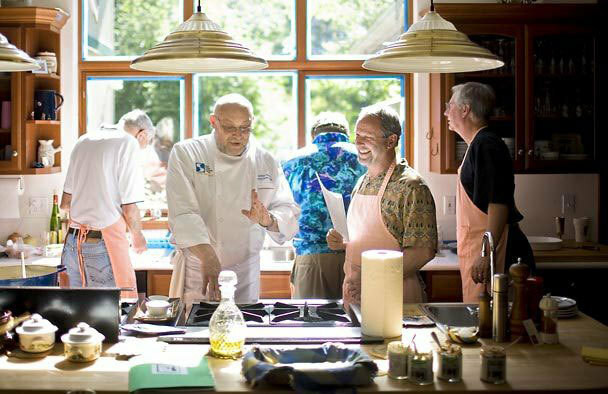 That’s why, coming off the heels of its Best B&B Breakfast recipe tournament (full disclosure: I had the pleasure of serving as a guest judge), BedandBreakfast.com is revealing its Top 10 Culinary Inns. And if breakfast isn’t enough, there are plenty of other ways to bring out your inner gourmand, including gourmet dinners, cooking classes, wine tastings, and even welcome desserts right when you arrive. Abingdon Manor Country Inn & Restaurant in Latta, South Carolina: Hands-on cooking classes and wine tastings, followed by a six-course dinner. Plus an onsite restaurant, featuring produce from the inn’s garden. Auberge de Seattle; French Country Inn in Woodinville, Washington: Homemade gourmet desserts upon arrival plus classes on regional French cuisine. Casale San Bartolomeo in Marsciano, Italy: Italian-focused wine and olive oil tastings, as well as classes on traditional Umbrian and Roman dishes. Plus, vineyard and olive oil route tours. Chestnut Street Inn in Sheffield, Illinois: Organic food with a Mediterranean twist from local farms, and cooking classes based on what’s in season. Cocoa Cottage Bed & Breakfast in Whitehall, Michigan: A welcome chocolate dessert, chocolate bon bon turndown service, and a gourmet breakfast featuring, you guessed it, chocolate. Elm Creek Manor in Gainesville, Texas: The opportunity to pick farm-fresh produce, gather eggs, and milk a goat right on the grounds. Plus, a six-hour cheese-making course. Hartstone Inn & Hideaway in Camden, Maine: One-on-one cooking class with the chef, breakfasts incorporating local ingredients including lobster, and gourmet picnic basket adventures. Harvest Moon B&B in New Holland, Pennsylvania: Cooking lessons and tours to local farms in Amish country. Plus, murder mystery dinners that include cheese, wine, and chocolate tastings. La Bastide des Princes en Provence, France: Provencal cooking and pastry classes with Chef Pierre Paumel in a 17th-century manor setting. The Chadwick Bed & Breakfast in Portland, Maine: Gourmet weekends with cooking classes and wine tastings. Plus the Gosling Rum Croissant Bread Pudding, which made it to the Final Four in the 2013 Breakfast Recipe Tournament. What culinary inns have you stayed at? Tell us what you ate in the comments below.